The beginning of a new year is traditionally a time for resolutions and new goals. However, I’ve lived long enough to know that most resolutions don’t last for long. As my friend Sandy says, “In order to keep my New Years resolutions for 2014, I have divided them into 3 categories. Things I won’t do now. Things I won’t do later and things I will never do.” I love Sandy. Coincidently this blog is starting now but it was an idea that began several months ago. I’m excited to give it a try. What to have for New Year’s Day? I grew up in North Carolina so I consider myself a Southern girl. Even though I haven’t lived there for many years I will always resonate with all things southern. Ironically, the traditional New Year’s Day meal that I grew up having has never been my favorite. The meal was thought to bring good luck and each food represented something. My Mom would always serve black-eyed peas which were for prosperity , greens (collards, mustard or turnip greens) which were for money, ham which was for positive forward motion and cornbread which was for gold. On New Year’s Eve, my friend Rick told me he was going to enjoy Shao-Mai Dumplings on New Year’s day. Since my husband and I were in a “Wine & Dine” club with he and his wife Anne and several other couples years ago, I’ve had Rick’s dumplings. They are divine! So, I couldn’t get those precious dumplings off of my mind. I shopped for the ingredients on New Year’s Day and am just making them tonight. Better late than never. I have heard they may be a popular thing to serve for the Chinese New Year. Either way, they are delicious! Here’s the recipe in case you want to make some too. Peel fresh water chestnuts. Blanch water chestnuts in plain boiling water for 15 seconds, then drain and rush under cold water until chilled. Chop the water chestnuts by hand to a neat, peppercorn-size dice. Or, if using the canned I just open the can and pour into the pork mixture towards the end of the process. Mince the ginger and scallion in the work bowl of a food processor fitted with the steel blade, scraping down as necessary until fine. Distribute the pork around the blade, add the remaining filling ingredients except for the water chestnuts, then process with pulses to blend. Do not over process to a paste. Put in the chestnuts last. Stir in if you have chopped them to a peppercorn-size dice or put them in the processor and briefly pulse if your pieces are larger. The filling may be sealed airtight with a piece of plastic wrap pressed directly on the surface, and refrigerated several hours or overnight before using. Arrange the filling, the wrappers, a saucer with the carrots, a small bowl of water with a pastry brush and a tablespoon side by side on your work surface. Keep the wrappers covered as you work, so they don’t dry out. Line a baking sheet with a silicon (non-stick) mat or parchment paper if you are working in advance. 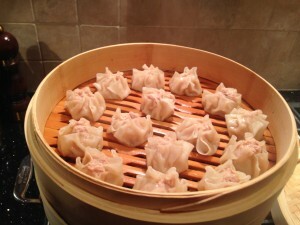 Or, if you will be steaming the dumplings immediately, oil the rack of a bamboo steamer or the surface of a heatproof plate at least 1 inch smaller in diameter than your steamer with an even film of sesame oil, so the dumplings will not stick once steamed. Fill and shape the dumplings one by one. Place the wrapper on some parchment paper. Brush with some water and place 1 scant tablespoon filling in the center of the wrapper. Bring the wrapper up around the filling. Fold and pleat as you gather the wrapping around the filling, leaving the top of the filling uncovered. Gently tap the shu mai on your work surface, flattening the bottom and allowing it to stand upright and make a basket shape. Gently press the carrots into the pork filling if you are garnishing. Put the finished dumplings on the oiled surface of the steaming rack or refrigerate on parchment-lined baking sheets for several hours, sealed loosely but airtight if not steaming right away. If you reserve for later bring them to room temperature before steaming. Find a pot that your steaming baskets will fit securely on. Bring the water in the steaming vessel to a gushing boil over high heat, then reduce to medium to maintain a steady steam. Add the dumplings to the steamer basket and stack on top of the boiling pot. Be sure and use the basket cover. Steam for 25 minutes or until the pork looks done. This makes about 30 dumplings. Enough to serve 10-15 as an hors d’oeuvre, about 6-8 as part of a multi course meal, or 4-5 as a more substantial accompaniment to soup or another dish. This seems like a lot of work but I promise you it is worth it. I purchased my bamboo steamer basket at an international grocery store years ago and I’ve never regretted it. This is a favorite for my family.